David Zalubowski | The Associated Press A Frontier Airlines jetliner is pushed away from a gate on concourse A at Denver International Airport on May 15, 2017, in Denver. HARLINGEN — Valley International Airport welcomed Wednesday the touch-down of the first flight of its newest passenger air carrier. Frontier Airlines, which will be the fifth passenger carrier to fly in and out of VIA, was scheduled to land its first aircraft just in time for the holiday season. The flight from Chicago O’Hare Airport to Harlingen will be the first of an aggressive passenger flight schedule planned by Frontier. “Thanksgiving Day there (was) a Denver flight and then Saturday another Chicago flight and Sunday another Denver flight,” said Jose Mulet, director of air service development and airline ground handling services at VIA. Frontier flights from Harlingen to Chicago O’Hare will be available on Wednesdays and Saturdays, departing Harlingen at 6:05 p.m. and departing Chicago at 1:54 p.m.
“Of course the first flights are full but looking out over the next few months they look really strong,” Marv Esterly, director of aviation at VIA, said of demand for Frontier flights. “Not just through the holidays but if you go out through February … bookings in the 80s and 100s are already there, pre-bookings. “Actually, schedules have been loaded all the way to October of next year so that must mean that they’re pretty pleased,” he added. 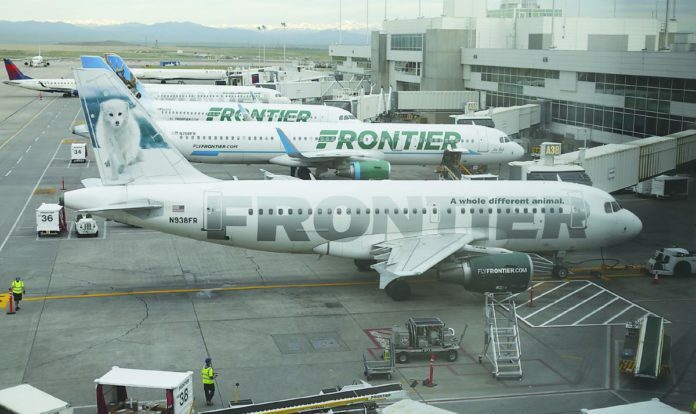 Frontier Airlines joins Southwest Airlines, United Airlines, Delta Airlines and Sun Country Airlines in providing passenger service to and from VIA. “We’re here for one reason and one reason only, and that’s to make sure the citizens of the Rio Grande Valley have the best flights in and out of here,” Esterly said. Esterly said the Chicago flight is now the more popular one, which was to be expected. But he said the Denver flight to Frontier’s home hub will open up the entire West Coast to low-cost flights. Esterly said the Frontier flights are already expanding what is called the airport’s “catchment area,” which is the radius from which a facility like VIA attracts passengers. Mulet said potential passengers can book a flight directly with Frontier or use travel services. A ribbon-cutting event to welcome Frontier will be held at 9 a.m. Tuesday. Weather permitting, the Frontier flight and its passengers and crew will be greeted with the traditional water cannon salute.